Extraordinary and rare form of hardy Poet’s Jasmine that we love for its dramatic bi-colored flowers. The buds and the outside of the tubular flowers are both bright red. The clusters of very fragrant flowers then open to an interior of pure white. 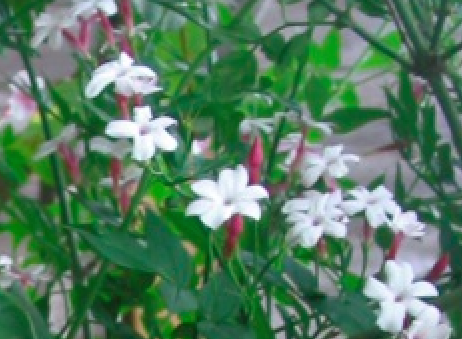 The distinct bicolor effect reminds us of the much more tender Rose Jasmine (Jasminum polyanthum) Vigorous twining vine to 15′ very quickly. Provide strong support- such as #4 copper wire. Excellent on large pergolas or along fences where the clusters of deep red buds pre-bloom is just as showy as the open flowers. In fall this deciduous vine takes on amazing brilliant red tints before dropping its leaves. Full sun to part shade in average to enriched well drained soil. Regular summer water increases growth and spurs re-bloom. Usually there is a massive floral display in June with sporadic clusters of flowers into September. Easy, pretty vine. Sweetly fragrant from the evening to the early morning. Drought adapted when established. Moderate deer resistance.